After living a comfortable life in Holland, the goal of the congregation had not yet been met. The Scrooby congregation, though small in number, contacted the Virginia Company in London. Boarding the Speedwell, the tiny congregation set sail for Delfshaven on 22 July 1620. Once in England, the company continued to grow and the Speedwell proved to small of a ship for all the Separatists. Finally, the whole group booked passage on a much larger ship, The Mayflower, which left for Plymouth harbor on 16 September. The ship was overcrowded and under provisioned, bearing “in addition to its crew of forty-eight, one hundred and one passengers.” Of the 101 passengers, fifty-six were adults, fourteen were servants and hired artisans, and thirty-one were children, of whom seven were orphan stowaways. 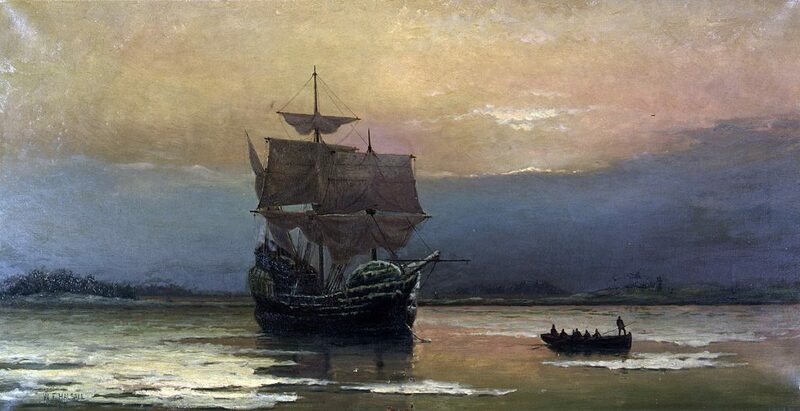 They landed at Plymouth Rock on November 11, 1620. Every night after landing, the colonists heard the orchestration of the untamed wild mingled with the calculated rhythm of distant drums, the unfamiliar echoes of the yet vastly unknown natives. These intonations formed the breath of the unconquered land. The colonists nick-named their land the “howling wilderness.” The Howling Wilderness stretched from northern tip of Maine to sprawling hills of Georgia. Few souls would venture deep into the dark forests; fewer still would consider taking up permeant residence, let alone on the eve of winter. Within the first three months of landing more than half the settlers died, adding to the howling a groan for the lost. But here I cannot but stay and make a pause, and stand half amased at this poore peoples presente condition; and so I thinke will the reader too, when he well considers [the] same… They had now no friends to welcome them, no inns to entertaine or refresh their weatherbeaten bodys, no houses or much less townes to repaire too, to seeke for succoure… And for [the] season it was winter, and they that know [the] cruell & fierce stormes, dangerous to travill to known places, much more to serch an unknown coast. First, Elder William Brewster, who became the congregational leader upon the death of the previous minister, led the group with a powerful vision. Elder Brewster was a layman who led Sabbath meetings for the colony. One Dutch visitor recorded of Brewster’s services, he “taught twise every Saboth, and [yet] both powerfully and profitably, to [the] great contemment of [the] hearers, and their comfortable edification; [yes] many were brought to God by his ministrie.” Despite being theologically uneducated, Brewster maintained a strong commitment to religion and Sunday attendance. Brewster’s way of life became the American way of life for nearly three centuries. Second, Deacon Samuel Fuller and Edward Winslow are worth noting. Though neither of these men were particularly theologically minded, nor were they aggressively religious, they still influenced the church of the Plymouth Colony. They particularly sought to found a free and able political body which was thoroughly congregational, and whose chief significance was found in both religious life and courageous ventures. “There are reasons for the failure of the Pilgrim Father to achieve greatness – which they never aspired to in the first place.” We could point out that the piece of Howling Wilderness, on which they landed, was not particularly fertile. As a part of the Virginia Company, the colony had finical responsibilities it could not possibly meet. Many of the colonists were not themselves properly prepared to start a colony. These points notwithstanding, we can draw some important conclusions in understanding American culture. First, the Puritan way of life created incredibly disciplined people. Puritanism had a deep capacity for shaping people into a particular mold. Each of these men and women were so utterly shaped by Puritanism that they would sacrifice all security and pleasure to lead one of the boldest ventures the world has ever seen. Puritanism established hard work, perseverance, and faith as the cultural norm of Americans. Until the mid 1960s, these Puritan ideals were deeply engrained even within secular Americans. Second, the colony succeeded in producing a firmly established representative government. The government was both civil and ecclesiastical, it elected statesmen, attended to roads, and arranged for maintenance of the minister and meetinghouses. We could not call the government established a theocracy. In fact, it was quite far from it. Ministers were given a prophetic voice in the government but had no direct control over civic affairs. The pulpit dominated the thoughts of each colonist, but no pastor or minister had any right to establish his own ecclesiastical law. While the colony had no separation of church and state, the church’s role was to influence the state. Each person in the colony deeply feared and understood that mankind was fallen. The check against the evil of men’s hearts was the necessary role of the church and her ministers. While the colony was largely established by the uneducated, one cannot help but look at the great strides towards education that the colony made. By 1636 the colony voted to “give 400 [pounds] towards a scholae or colledge.” By 1639 the first printing press in the American colonies was established at Cambridge and by 1640 the first American book was published, The Whole Booke of Psalmes Faithfully Translagted into English Metre, Whereunto is prefixed a discourse declaring not only the lawfullnes, but also the necessity of the heavenly Ordiance of singing Scripture Psalmes in the Churches of God. After God carried us safe to New England, and wee had builded our houses, provided necessaries for our lively-hood, rear’d convenient places for Gods worship, and settled the Civill Government; One of the next things we longed for, and looked after was to advance Learning and perpetuate it to Posterity; dreading to leave an illiterate Ministry to the Churches, when our present Minister shall lie in the Dust.